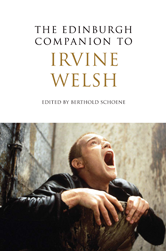 The subcultural enfant terrible of devolutionary protest and rebellion, Irvine Welsh is now widely acknowledged as the founding father of a whole new tradition in post-devolution Scottish writing. The unprecedented worldwide success of Trainspotting, magnified by Danny Boyle's iconic film adaptation, revolutionised Scottish culture and radically remoulded the country's self-image from dreamy romantic hinterland to agitated metropolitan hotbed. Though Welsh's career is very much an ongoing phenomenon, his influence on contemporary Scottish literary history is already quite indisputable and enduring.